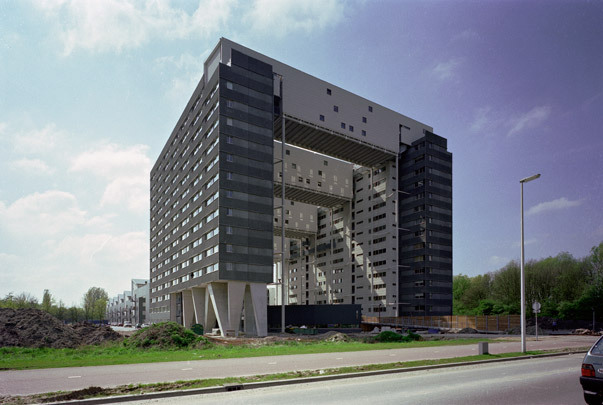 This dense complex of 1000 or so student bedsits per hectare stands on the southern rim of university campus De Uithof. All units occupy a monumental gateway building and a low-rise portion linked to it. The offbeat detailing and urban scale of the taller block stand it in good stead with the university buildings on the north side. The 'roof' of the gateway consists of four residential 'bridges' that step down to enable the sun to penetrate their considerable depth. By contrast, the low rise with its narrow street channels and raised promenade has a rustic air about it that weds well with the idyllic meadow landscape.